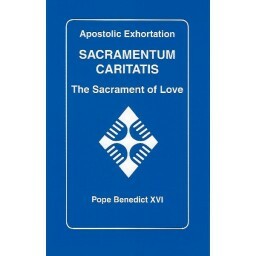 The Sacrament of Charity (Sacramentum Caritatis) Set alongside Pope Benedict XVI's first encyclical God Is Love (Deus Caritas Est) where he stressed the relationship between the Eucharist and love, The Sacrament of Charity picks up that theme and expands it as Pope Benedict explores the mystery of eucharistic faith and how it reveals the mystery of the Trinity. Released on the Feast of the Chair of St. Peter, the Holy Father examines the important relationship between the Eucharist and the other sacraments, including the sacrament of the Church. He also highlights the social implications of the Eucharist and firmly connects it with the Church's social teaching.